Due to unforeseen issues, we regret to announce that the Francis Dunnery show originally scheduled for March 25th has been cancelled. Existing ticket holders will be issued full refunds within the next 24 hours. We hope to have Francis grace our stage sometime in the future. 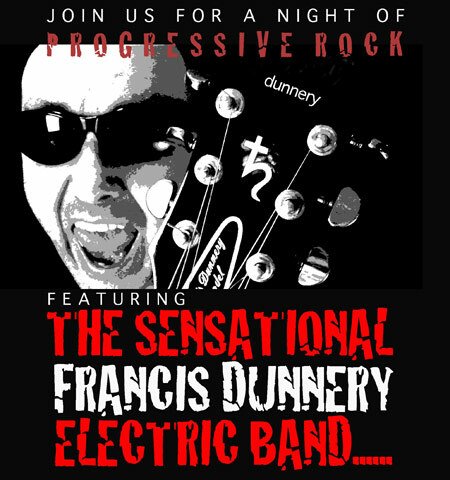 Francis Dunnery is a Multi-Media artist. His work combines music, humor, astrology, video, literature, performance art, philosophy and blistering electric guitar. Francis first hit the public stage back in the eighties as lead vocalist and guitarist for the progressive rock band ‘It Bites’. He has since gone on to have a very successful musical solo career spanning twenty years. During this time he has written, produced and performed music with some of the most successful artists of his time, artists such as Led Zeppelin’s singer Robert Plant, guitar legend Carlos Santana, John Mellencamp, Squeeze’s stalwart Chris Difford, Stone Roses’ singer Ian Brown, R&B superstar Lauren Hill, Genesis guitarist Steve Hackett as well as guesting with a host of bands and artists such as Yes, Asia, Hootie and the Blowfish and The Syn. Francis is accomplished in his own right, turning out ten engaging albums of original yet diverse composition and three DVD’s. Alongside his music career, Francis is a long time student of philosophy, psychology and astrology. He has a thriving international astrological practice based upon the works of world-renowned psychologist and astrologer Dr Carl Jung. Francis was a pioneer in offering online astrology readings via Skype as early as January 2004, six months after Skype was launched, a practice that still continues successfully to this day. Francis is also the president and founder of ‘The Charlie and Kathleen Dunnery Children’s Fund’, a charity he set up to honor his parents. The CKDCF is dedicated to children’s health and wellness proving grants and donations that directly benefit the children of West Cumbria, England. The CKDCF is broad in their giving; providing funds to hospitals, for beds in cancer wards and assistance to mothers and fathers whose children are affected by the disease, providing funds to schools to purchase books and music equipment, building libraries, providing sports and playground equipment to local organizations and much more. The CKDCF is an international charity sponsored by benefactors from around the globe. Every October, Francis and his friends from around the world, gather in Cumbria for a benefit concert and charity walk in support of the CKDCF. Because of his rich diversity, Francis Dunnery is impossible to pigeonhole. A serial risk taker, in 2005 Francis broke new ground once again when he initiated his House Concerts Series, offering his fans the opportunity to host intimate evenings of music, psychology, philosophy, astrology, all topped off with his tremendous humor. The shows became so popular that Francis has performed approximately a hundred and fifty shows a year for the past eight years. He has taken these unique, inspiring and entertaining shows to front rooms throughout the world! Places as far reaching as New Zealand, Australia, UK, Denmark, Sweden, Norway, France, Spain, Italy, Holland, Switzerland and Germany as well as every corner of the USA and Canada. The shows have become an international phenomenon. Although his style can be brash and at times irreverent, he’s also capable of singing achingly beautiful music that penetrates the soul. Many have said Francis’ House Concerts are life changing and unlike anything they have ever experienced before.